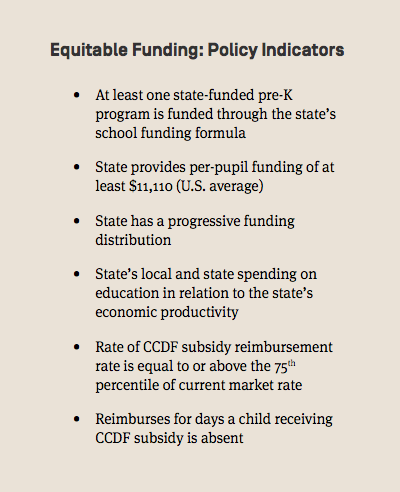 Our report evaluated states on six policies related to equitable funding (listed on the right). Because of the important impact that funding has on policy implementation, we gave significant weight to policies in this category. (See our methods here on page 6). To best meet the needs of students, states should prioritize education in their budgets, provide sufficient per-pupil funding, and allocate more money to districts with more students facing poverty (i.e. use a progressive funding distribution). 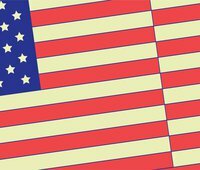 It’s clear that all states can make improvements in their policies and funding formulas to better support early learners from lower-income backgrounds, both in child care and elementary school. Funding is too often a third rail issue, but we must acknowledge that very few of the policies discussed in our report can become a reality without sufficient funding. It’s not all about money, but money does matter."